Please Click on the rule book to review our current rules. The A.G.M. 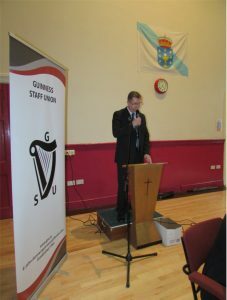 of The Guinness Staff Union takes place on Wednesday 14th March at 4.30pm in the Parochial Hall James Street Dublin 8. The venue is right beside James St Church and across from the Medical Center in James Gate. All benefit members are welcome to attend . If members wish to have a resolution or amendment to the rules considered at the A.G.M. they should send the text of their resolution to the Union before 1st February signed by themselves and another member of the Union. Record of the previous A.G.M. Neri Housing Document click here to read the full text. ICTU Conference endorses GSU Housing Motion. 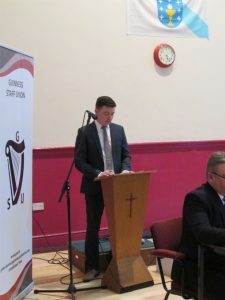 The motion was moved by The GSU General Secretary John Dunne at the Conference in Belfast on the 5th of July at the session on Housing and Social Solidarity. 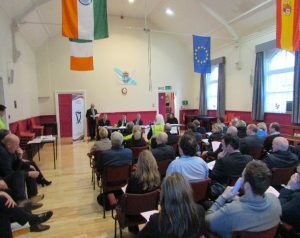 The GSU will endorse the recently published document from the Nevin Institute which seeks to promote a European cost rental model and also socialise the cost of new affordable Housing through a designated Housing Company providing the badly needed houses across the Country. The cost of renting in Dublin range from €1032 to €1911 per month depending on area . This makes it extremely difficult for any young worker if they wish to save for a deposit which is set at 20% of the total Mortgage value. 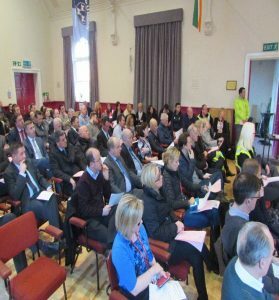 Trade Unions across Ireland want the Housing Emergency addressed through adapting the proposals contained in the Nevin Institute document. The Guinness Staff Union Supports the Mayfest 2017 project and we encourage members to attend as many of the events as they can. The programme kicks off in the Cois Lfe Bar at Liberty Hall at 3pm on May Day 1st May after the May Day parade in Dublin . ICTU Private Sector Bulletin Spring 2017. In Light of the very serious threat to many thousands of jobs in the manufacturing and services sector, Congress will now seek an urgent engagement with the Government, opposition parties and business groups such as IBEC, with a view to ensuring that the Brexit negotiations deliver an poutcome that protects and maintains workers livelihoods and supports high standards of employment. Brexit presents us with and unparalleled challenge that will require a clear, co-ordinated and strategic response. Current E.U. rules and short term thinking should not be used as an excuse when addressing the potentially devastating economic impact of Brexit, a process that itself raises doubts about the very future of the European project. Congress has published a short report on current employment in Ireland broken down by Sector in the Manufacturer and Services industries and the implications for Brexit on jobs .The report is available on www.ictu.ie.